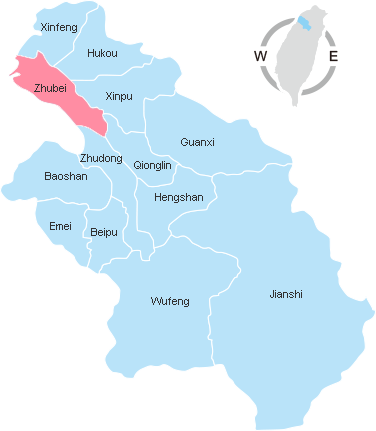 Hsinchu County’s administrative area is divided into 1 county-administered city, 3 towns and 9 townships, namely: Zhubei City, Zhudong Town, Xinpu Town, Guanxi Town, Xinfeng Township, Emei Township, Baoshan Township, Wufeng Township, Hengshan Township, Beipu Township, Jianshi Township, Qionglin Township and Hukou Township. Located on the north point of Hsinchu County, Xinfeng Township is next to the Taiwan Strait. Xinfeng is also the location where the Dutch landed in 18th century. Therefore, it was also called the Hongmao Kan (Red Hair Port). Its rich shore resources provide much advantage for the development of the township. The convenient transportation brought by Provincial Highway 1 and Chu-3 Highway has made southeastern Xinfeng a good spot for industrial development. The industrial zone there has brought much benefit to local prosperity. The opening of the Shibin Highway and the use of the coastal resources, together with the golf course and recreational facilities have made the area a potential spot for tourism. Located in northwest Hsinchu, Chungshan FreeWay(National Highway No.1), Shibin Highway(Provincial Highway No.61) and Provincial Highway 1 provide convenient transportation to the city. It is the most important gate of the Hsinchu area. The county government and urban service center are located in the city. In additon to the completion of the THSR Hsinchu Station area, Hsinchu County Government Phase II, NTU and the NTUT Zhubei Campus projects, the formation of the central-island industrial development will further prosper Zhubei City. The fusion of all ethnic groups is another feature in Zhubei. Different ethnic groups living in the city respect each other and many learn the mother tongue of others. Moreover, close cooperation in local construction and development will make Zhubei the leading city of future development in Hsinchu County. It was originally called Dahukou or Dawokou, and Hukou is an abbreviation of these older names. Located at the border with Taoyuan County, it is a town on Hukou Plateau in the northwest of Fengshan. As the Hsinchu Industrial Park is located in the township, it promotes industrial and commercial development around the township. Hukou Old Street is a famous attraction for historical monuments and the cathedral located at the corner of Hukou Old Street was the old railway station. After the railway station was moved to Hsinhukou in the west, the prosperity of Hukou became history,except the street scenes left for people to recall the glory in the past. Today, tourism and rural renewal have brought a second chance to old Hukou. Located in northeastern Hsinchu County, the mountain area of the town links with the Hukou Plateau, and Shali River runs southerly in between. The main street is the traffic, culture, business and agriculture product center of the township. Han people cultivated Xinpu Township over two hundred years ago. Due to the early Hakka settlement and the land-locked characteristics, Hakka tradition is well preserved in the town. The famous Hakka bantiao (rice noodle) and persimmon cakes are still beloveds of locals. The Yimin Temple in Fangliao is even the faith center of Hakka people.The expansion project of Tai-118 and Tai-115 highways has provided better connections to Chungshan Freeway and Taipei Second Freeway.Therefore, it brings more visitors to Xinpu on weekends. Located in northeastern Hsinchu County, the mountain area of the town links with the Hukou Plateau, and Shali River runs southerly in between. The main street is the traffic, culture, business and agriculture product center of the township. Han people cultivated Xinpu Township over two hundred years ago. Due to the early Hakka settlement and the land-locked characteristics of the town, Hakka tradition is well preserved in the town. The famous Hakka bantiao (rice noodle) and persimmon cakes are still beloved by local people. The Yimin Temple in Fangliao is even the faith center of Hakka people. The expansion of Tai-118 and Tai-115 highways have both provided better connections to Chungshan Freeway and Taipei Second Freeway. Therefore, it will bring more visitors to Xinpu on weekends. Emei is a Hakka and agricultural district that preserves the pure rural spirit. Emei River which runs through the township also nourishes the famous Oriental Beauty Tea. Fuxing tea factory is a hundred-year-old tea manufacturer. Thanks to the protection of the Ta-pu Reservoir Conservation Area, the rich natural resources and Hakka culture in the township have been preserved. The transformation potential of the township’s agriculture and recreational resources are the competitive edge of the district. With firm belief in preserving Ta-pu Reservoir Conservation Area and sustainable development, the county government hopes to develop the district into a suburban tourist attraction that combines recreational agriculture, religion and Hakka culture. Beipu district is mostly located on mountainside. It is divided into Beipu and Nanpu basin by the river. Though there is no broad and flat alluvial plain in the township, soil is still fertile and water resources are rich for irrigation. Beipu is one of the last-developed places in the county, and it was called Zhubei-bao Nanhsing Chuang. Due to its specific armed immigrant background and the Hakka influence, it became quite a different settlement. Beipu has accumulated rich historical heritage, so local cultural groups are very active, it is not only a dynamic preservation area of Dayi Hakka culture, but also a creative and energetic Hakka culture circle. The township is the business center of the county. It is next to Shangping River and Touchien River, the water resource is abondant. It is the traffic hub of the county and the most developed town among 8 other towns located to the south of the Tuochien River. It was one of the top three townships in Taiwan. Zhudong was famous for camphor. After the drilling of oil and the rise of the cement and glass industries, the development of forestation, Zhudong has become a prosperous township. As Touchung and Erchung districts of Zhudong are included in the Hsinchu Science and Technology Park, the township turns into a high-tech R&D center. Qionglin is located at the center of Hsinchu County and it is the smallest village in the county; however, its beauty of landscape and richness of culture is extraordinary. There were 20 to 30 private schools (mon guan) in the early age, which made Qionglin the literary land of Hsinchu. The Wenlin Pavilion was built in 1876 and it still exists. There is a Confucius Memorial Service on every September 28 to publicize the ideas of respecting teachers. Another literary spot is a house in Wenlin village, named "Zhi Liao Wo". It was a place to produce papers and it also worships the unique god- Tsai Lun- the father of paper-making. The reminiscence of Qionglin is richer at the old streets next to the Kwan Fu Temple. The wood-made and brick-made two-floors old buildings are still there and the traditional stithy, tofu stores, rice stores are still open. The time seems passing by slowly at Qionglin. During January and February, the citrus and other produce such as Haili tangerine, tomatoes, Kaoche pears, and Maoku tangerine, etc, are productive. The beauty of landscape at Qionglin not only makes the Feifengshan famous but becomes the satellite town of Hsinchu Science and Technology Park. The ingoing of technologists and county jurisdiction take the township into modernization. Neiwan railway is the lifeline of the local economy and it is the major transportation of Hengshang. It is surrounded by mountains on three sides and Fengshan River runs through the township. The river terrain at the meeting point of Niulan River and Fengshan River is the traffic hub of the mountain area in northeast Hsinchu. The opening of the Taipei Second Freeway has brought convenient transportation and the development of tourism to the township. These development projects Include golf courses, theme parks and resorts. Today, the township has the highest golf course density in Taiwan. Moreover, Guanxi is also the township of longevity. Located on the southwest of Hsinchu county, Wufeng is the second largest township and one of the two mountain townships in the county. It is inhabited by both Taiya and Saisha natives, which is also the origin of the tattooed face culture. The ancestral ritual of Taiya Tribe and the spirit ritual of Saisha Tribe are the most important cultural heritage of the area. Besides the beauty of cultural heritages, natural landscapes such as Qing Quan hot spring, the holy wood in Kuaishan, the scenery in Guanwu and DabaJianshan of Xueba National Park, also attracted many visitors every year. The cultivation of high elevation fruits and vegetables and the promotion of the recreational agriculture and culture trips have brought new opportunities for the development of the township. Located on the southeast side of Hsinchu County, Jianshi is one of the two mountain districts in the county. It is the hometown of Taiya people. It has rich natural resources, including Xiuluan Hot Springs, Simakusi, Zhenxibao Holy Wood, DabaJianshan, Taoshan, and Tieling in the Xueba Scenic Area. Therefore, the township has attracted many visitors. In recent years, local people have been engaging in the cultivation of high elevation vegetables. In combination with the online e-commerce, it is quite a potential business. With the temperate fruits such as peaches and pears, plus the recreational agriculture and culture trips, come new opportunities to the development of the township. Taiya people are born hunters. If we can establish a hunting culture park with hiking, wild survival training, folk activities,and plant ecology, the district will be the first training base of ecological talent in Taiwan. It helps to construct new ecological preservation concepts and provides an ideal spot for cultural trips in Taiwan.